Successful companies must have a comprehensive enterprise strategy. An enterprise strategy is your business’s approach reaching targeted customers and carving out a profitable niche in the market. These days, technology is crucial to this strategy. In fact, more than half of all workers report to using two or more devices at work. When using so many devices, it’s important to be able to seamlessly access data on each platform. To accomplish this, many businesses invest in a cloud computing system like IAAS to backup data. While there are several data storage options, there are many benefits of IAAS that your business should consider. Let’s take a closer look at how IAAS can help your enterprise strategy. But before we dive into the benefits of IAAS, let’s discuss what IAAS is, and how it differs from other data storage options. IAAS stands for infrastructure as a service. Other data storage options include software as a service (SAAS) and platform as a service (PAAS). SAAS is the most common type of cloud storage. These services use web applications to access cloud storage through a third-party vendor. Accessing the service through a web browser makes SAAS easy to use on multiple devices. Even if you are not very familiar with cloud technology, chances are you are familiar with SAAS technologies. Services like Dropbox and Google Docs are examples of SAAS that many businesses use. PAAS is a cloud solution appropriate for users who want to create their own applications. With PAAS, a business can access the framework they need to build a cloud storage system. By contrast, IAAS gives users automated and scalable systems that they can use to store their data. With IAAS, the third-party vendor handles storage, networking, and servers. The IAAS user would maintain their own databases, security components, and operating systems. As we mentioned above, SAAS cloud technologies are fairly ubiquitous. With the ease of accessing these services, why should your business choose IAAS? One of the greatest concerns when relying on SAAS technology is security. For small businesses, data breaches are a major concern. In fact, 14 million small businesses experienced data breaches in 2014 alone. So, while SAAS can be convenient and easy to access, that same convenience can make it vulnerable to data breach. That’s why one of the greatest benefits of IAAS is the ability to easily access files with added security. 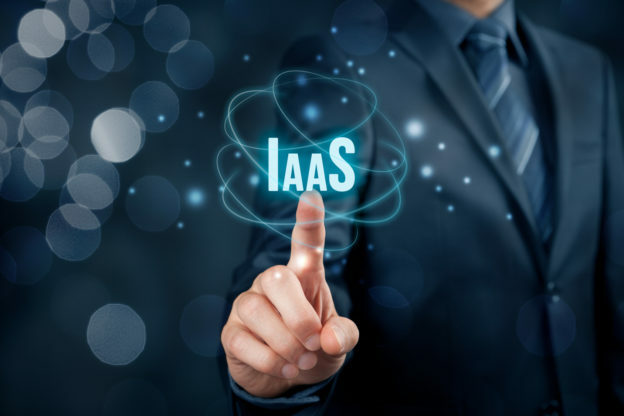 Now that we’ve looked at what IAAS is, and why it could be a good choice for your business, let’s look at some of its specific benefits. The benefits of this infrastructure can help you expand your enterprise strategy with confidence. The goal of every business is to grow. Success will lead your company to gain more customers and more workload, which will, in turn, lead to more data. When you’re working on building your company, the last thing you want to worry about is whether your data infrastructure can keep up with your growth. For one, you don’t want to have to slow down so your technology can catch up. Also, time spent worrying about your technology is time that you could have spent building your business. Luckily, with IAAS, you won’t have to worry. That’s because IAAS platforms use up-to-date technology that can easily scale up or down to meet your business’ needs. And, because the infrastructure is managed by a third-party service, you will be able to depend on experts to keep your system working. One of the benefits of IAAS is that it offers the best of both worlds in terms of cloud computing. While you’re not relying on an open-access platform like SAAS, you are also not entirely responsible for your own platform. Having a third-party service manage your infrastructure will save your company money over time. When you use an in-house storage system, you will pay for maintaining all of the equipment, no matter how much you use. With an IAAS service, however, you will only pay for the time that the application was actually running. It is definitely a waste of resources to purchase an in-house data solution that you won’t fully utilize. On the other hand, it can also be frustrating if you purchase a smaller storage system to save money, but then quickly outgrow it. With IAAS, you will not have this problem. When you are in the start-up phase, you can pay to only use a small amount of data. But, when your business grows, you will immediately be able to access more data through the IAAS. Best of all, you won’t have to wait to get set up with a new system. Setting up an in-house cloud storage system could take several days, or even weeks to set up. It will likely also require installation. By contrast, IAAS can easily be set up in a matter of minutes. This way, you will be able to get your data solution into place quickly, giving you time to focus on other areas of your business. When your business’s data is maintained digitally, there is always the concern that data can be lost. If you maintain systems in-house, you may not be able to backup your data in the event of a natural disaster. By contrast, when you use an IAAS, you can be confident that your data is secured. In the case of a data loss, you will be able to recover your business’s information in no time. With all of these benefits in mind, choosing infrastructure as service for your cloud computing can be a great choice for your business. If you would like to learn more about the benefits of IAAS for your enterprise strategy, contact us. We will work with you to find the right cloud tools for your business.